Long Silk Chiffon Scarf or Shawl with Fringed Edge This lovely silk chiffon scarf or shawl is sheer and lightweight. It has a long fringe edge. You can drape it over your shoulder for warmth, clip it in the frong or tie it around your neck under a coat or jacket. 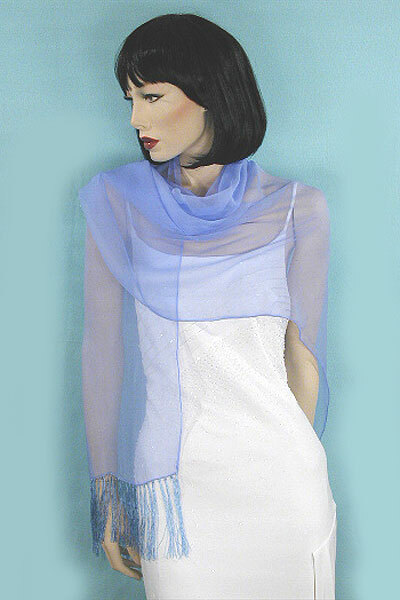 Silk chiffon scarves drapes well without sliding off your shoulders. It works well for both day and evening. Color: blue Hue: Code: #0066FF. Measurements: width 32", length 60.